A.M. Harsha S. Abeykoon, M. Branesh Pillai: “RTOS based embedded controller implementation of a bilateral control system,” The Journal of the National Science Foundation, Vol. 3, no. 42, pp 191-202 (12), Sept-2014, ISSN: 1391-4588. 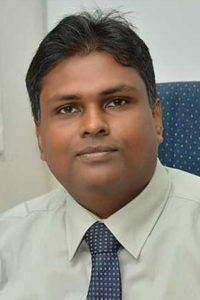 M. Branesh Pillai, G.V.A.G. AsankaPerera, M.K.C.D. Chinthaka, and A.M. Harsha S. Abeykoon“Analysis of a DC Motor Based Velocity Controller Using Disturbance Observer,” Indian Journal of Scientific Research, Vol. 5, no. 1, July -2014, ISSN: 0976-2876 (Print) / 2250-0138 (Online). 5. M. K .C. Dinesh Chinthaka, A. M. Harsha S. Abeykoon “Friction Compensation of DC Motors for Precise Motion Control Using Disturbance Observer,” ECTI Transactions on Computer And Information Technology, Vol. 9, no. 1, pp 66-74, May-2015, ISSN: 2286-9131. Monbukagakusho scholarship award (from the Japanese Govt.) for 5 years. Keio Leading Lab (KLL) grant for consecutive 3 years.